Our first stop was at the Fuji Shibazakura Festival. It’s located at the base of Mt. 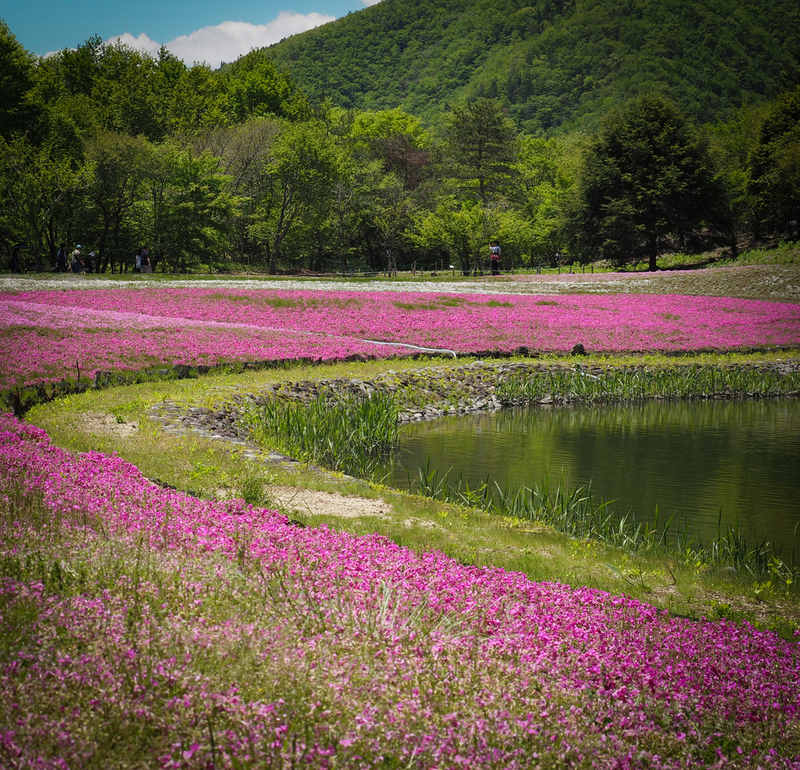 Fuji and is the largest expanse in the greater Tokyo area of moss phlox (shibazakura) with over 800,000 blossoms. My visit was towards the end of the season and many of the blossoms had already come and gone, but there was still enough left to tint the landscape with shades of pink and purple. I was also lucky because Mt. Fuji was out that day. The second stop was at a strawberry farm where you could pick and eat all that you wanted for 30 minutes. There were even sauces for dipping. I’ve been to fruit farms before where you could pick your own fruit, but never where you had to eat it all while you were there. You couldn’t take any with you! I mean how many strawberries could/would someone eat in 30 minutes? It might as well been all you can eat in 5 minutes because that’s all the time I needed to get my fill. After about 10 berries I was already strawberried out. Next was a stop at a brewery for a tasting and tour. I sampled sake, wines, and shochu. And last but not least we stopped at the Narusawa Ice Cave, also at the base of Mt. Fuji near the east entrance to the Aokigahara Forest (also known as the suicide forest). It is named the Ice Cave because the temperature is 37 degrees and is covered in ice all year round. Taking a tour may not cheap but you get someone to drive you to places you would otherwise probably never go, and you have someone to help with the language barrier. I think you get what you pay for and in this case…it’s convenience!